You Can Do It Too - Your Daily Cup of Inspiration! 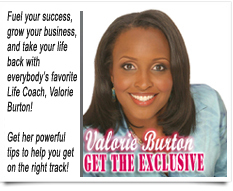 When I interviewed successful Christian Author and Life Coach, Valorie Burton for the exciting March Feature Story in EEW Magazine, she said something that really struck me. Before Valorie came into her own, she told me that she always used to feel like other successful people knew something that she didn't know. It seemed like they had some secret, or magic formula that made them more fruitful and productive in their own lives--one that she wasn't privy to. Unfortunately, this very assumption held Valorie back for so long, because deep down inside, she felt like she didn't have the wherewithal to make her own dreams come true. But once she realized that this false idea was, in fact, hindering her, she found the strength to break through that invisible barrier and live her best life. As I sat there talking to her, I thought about myself before I began living my own God-given dreams. I used to be so afraid that I didn't have what it took... that I would fail... or that others were equipped with knowledge, wisdom, and capabilities I did not have. But once I cast fear aside and pursued my vision, I saw amazing things transpiring much faster than I ever thought they would. "But once I cast fear aside and pursued my vision, I saw amazing things transpiring much faster than I ever thought they would..."
As you're reading this post today, I don't know what dreams might be burning in your heart, but here's one thing I do know... whatever God has implanted in your spirit can be achieved. The blessings of the Lord aren't reserved for an exclusive group of people. His abundant favor is for you too! But you must be willing to launch out in faith with full assurance that He is faithful that promised. Whatever He 's spoken concerning you will no doubt come to pass! Don't think you don't have what it takes, because you do. I know how it feels to be uncertain of your future, and doubtful of your abilities, but here's what you must do. "Trust in the Lord with all your heart, And lean not on your own understanding; in all your ways acknowledge Him, and He shall direct your paths" (Proverbs 3:5,6 NKJV).